The two major parties have done their job in terms of setting the parameters for the 2012 presidential nominating process. Now, it is time for the states to fill in the blanks. And what they do in that regard over the next few months could go a long way in determining who wins next year’s Republican presidential nomination. In short, will the nominating process next year be heavily “front-loaded,” as it has been in the recent past, which rewards the candidate with early momentum and concludes by the Ides of March? Both national parties have agreed to push back the start of their nominating process by one month from 2008. That year, Iowa and New Hampshire voted in the shadow of New Year’s Day, and by Super Tuesday (Feb. 5), more than half the country had voted. To nearly everyone in the political community, the last nominating season began too early, peaked too soon and, for Republicans, was over much too quickly. John McCain had the nomination wrapped up by early March. In addition, new GOP rules forbid any contests held before April 1 to award all of a state’s delegates to the statewide winner. That could be a major concern to Republican leaders in many early-voting states, who used winner-take-all in the past to attract the interest of candidates and enhance their state’s influence. If their state votes before April 1 next year, it will be required to provide for the division of delegates proportionately among candidates to reflect their share of the vote. However, to David Norcross, the former chairman of the rules committee of the Republican National Committee (RNC), the change is “majestically simple.” For a decade, Republican rules makers considered an array of complex plans to arrest “front-loading,” including ones where states would vote in inverse order of size. But with the elimination of pre-April winner-take-all events in 2012, many GOP officials hope that they have not only found a simple way to slow down the nominating process but also to encourage states to hold their primary or caucus well after Super Tuesday. Democrats and Republicans are on the same page when it comes to the 2012 presidential primary and caucus calendar. For both parties, the sanctioned start of the delegate-selection season will be a month later than 2008, with Iowa, New Hampshire, Nevada and South Carolina voting in February, and the rest of the country permitted to weigh in beginning the first Tuesday in March. 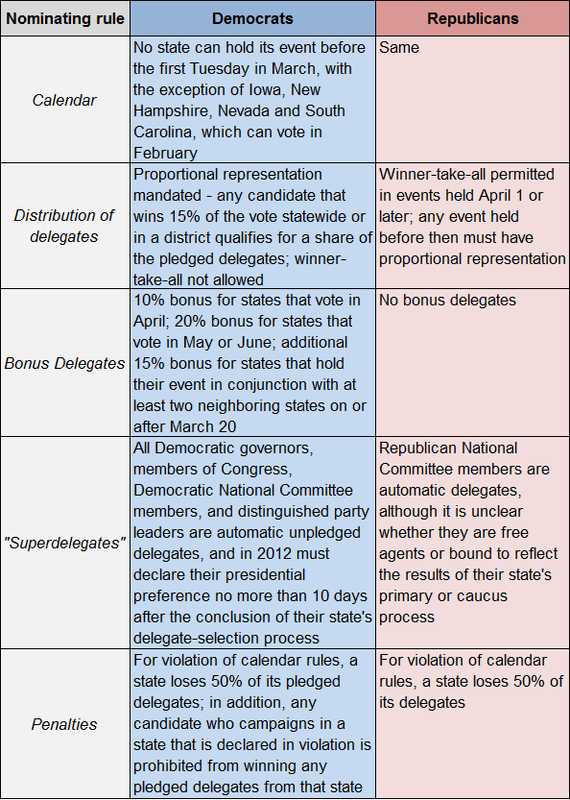 The two parties have their differences on other facets of the rules, such as winner-take-all versus proportional representation, the awarding of bonus delegates to states and the role of “superdelegates.” Still, both parties have adopted rules for 2012 designed to discourage the long-running trend toward “front-loading,” characterized by a mad rush of states to a position near the start of the delegate-selection season. Yet not every state has bought into this line of reasoning. John Ryder, the chairman of the RNC rules compliance committee, still expects there will be “a gaggle, a pride, a covey of primaries” on next year’s Super Tuesday, March 6. Florida broke ranks in 2008 to hold its primary a week before Super Tuesday and is threatening to do so again next year. Many Sunshine State politicians figure that as a populous, fast-growing swing state, Florida deserves a prominent early spot on the calendar. “We want to go fifth,” Florida GOP Chairman Dave Bitner recently said, according to the Sarasota Herald-Tribune. If that happens, Florida would vote after the four sanctioned February states but before the glut of those voting in early March. As of now, however, Florida’s primary is scheduled for Jan. 31, 2012, which obviously violates the national party’s new rules. A final decision on the state’s primary date will likely be made early this fall by a 10-member commission stocked by Florida politicians. They appear willing to accept the RNC’s penalty for holding an unsanctioned early event: the loss of 50% of Florida’s delegates as well as the prohibition on awarding the rest on a winner-take-all basis. As inviting as Republican rules changes may be, an even greater factor that could alleviate “front-loading” next year is the strain faced by state budgets. No longer are many states in position to fund both a free-standing presidential primary as well as a state primary later in the spring or summer to fill out the rest of the ticket. In California and New Jersey, there are already moves under way to push back the states’ February presidential primaries and consolidate them with June state primaries. (If they stay where they are, they too would be in violation of the rules of both parties.) In Tennessee, there is a bill that would lump the presidential primary with local elections on the first Thursday in May. And in Washington, there is an effort to do away with the primary altogether and elect all the delegates through a caucus process, which supporters say could save the state $10 million. Over the years, the relatively low-turnout caucuses have been particularly receptive to candidates with a passionate base of support. Two decidedly ideological candidates, Republican Barry Goldwater in 1964 and Democrat George McGovern in 1972, both used strong showings in the caucuses to nail down their party’s presidential nomination. And in 2008, Obama’s dominance of the caucuses proved critical to his narrow victory over Hillary Clinton for the Democratic nomination. Of more than a dozen states where Democrats held caucuses last time, Obama lost only two – Nevada and New Mexico. Sources: “America Votes 28” (CQ Press) for 2008 Democratic presidential primary results; “The Rhodes Cook Letter” (June 2008) for 2008 Democratic caucus results.